It consists of three spans, four girders in each span. 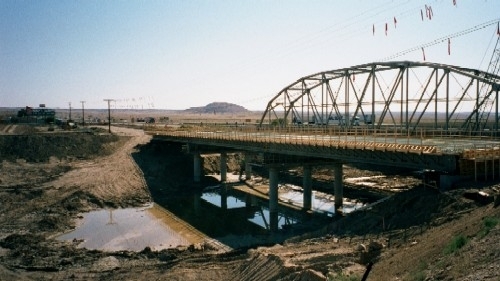 Girders are precast prestressed I-beams, approximately 30 m long. They support on-site cast monolithic concrete deck (see Figure 2). The girders were fabricated in open-air plant. The workforms of four girders, with the rebar cages and strands, were aligned, the strands put in tension and the concrete was cast. The girders were then steam cured at temperature in range of 60°C to 90°C. Three days after the pouring, the strands were cut and prestressing force were introduced into the girders. Approximately three months later, the girders were transported on site and the deck was poured. The main aim of the project has been to monitor prestress losses over the whole life of the bridge, including the early age of girders. 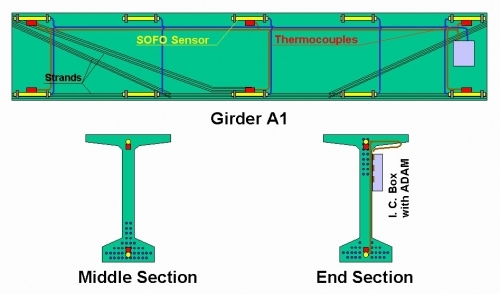 For this purpose, four girders were equipped with SOFO sensors and thermocouples as shown in Figure 3. Each girder has contained 10 SOFO sensors and 6 thermocouples. This configuration of sensors allows monitoring of deformation and curvature, and determination of thermal influences. 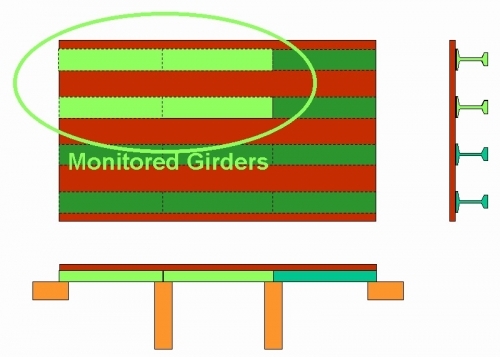 Using appropriate algorithms it is possible to determinate prestress losses in girders. Only four girders are selected due to symmetry of the bridge (see Figure 2). All sensors were installed before the pouring. 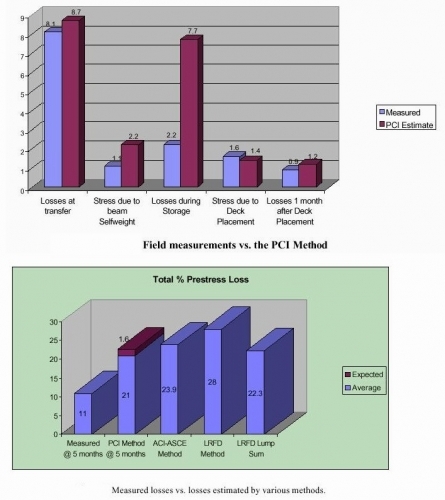 Details from installation phases are presented in Figure 4. Measurements started immediately after the pouring. In this way the early and very early age deformation were recorded during the first three days. The deformation is later recorded during the prestress phase, after each strand was cut. Thus, real initial strain state of girders was stored. Followed the period of continuous monitoring before transportation on-site, during transportation and during the pouring of the deck. In present, long-term monitoring is carried on. The results helped comparison with different theoretical models and confirmed very good condition of the bridge after construction.